When it comes to flooring removal, you have plenty of choices. But your number one choice must be efficient, reliable, and fast. The dust-free tile removal process relies on advanced equipment and knowledgeable contractors to get the job done right. If you are renovating your home, it only makes sense to choose the best service available. 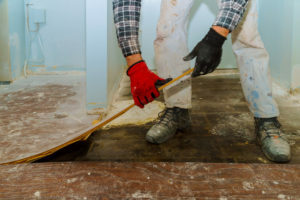 Here are a few reasons why you should choose fast flooring removal. Today’s fast floor removal companies, like American Flooring Removal, have invested a lot of money and countless hours into advanced flooring removal equipment. This equipment is designed to eliminate dust from the equation. Before such equipment was available, just one square foot of tile flooring could produce an entire pound of dust. All of that dust then settles on your furniture, walls, and in the air. It’s more than just a hassle; dust can be a detriment to your respiratory health. It’s right there in the name – a fast flooring removal process must be quick and efficient. It all boils down to the equipment and the training of the technicians. With the right machines, an experienced flooring removal team can have your old tile up and out in a single afternoon. Then, you’re ready to install your new flooring – hardwood, laminate, or even new tile – to enhance your home. If you were to hire an inexperienced contractor, the job would take up to a week to complete. That’s an entire week without a full room in your house. We always use skilled experts to tackle the toughest removal jobs in the area. These experts have years of experience and on-the-job training so that you receive unparalleled quality and commitment. Your old flooring will be a thing of the past before you know it! For top-rated, dust-free tile removal, contact American Flooring Removal by calling 469-556-3936!